I associate Agatha Christie with a paciness and lightness of touch. It was there in this game at brief intervals but would then get obscured again as a scene dragged on for too long or you had to hover your mouse over a cigarette someone was holding AND a box of matches AND an ashtray in order to deduce they were a smoker. Eventually it just felt like the interactive elements stopped being a mild diversion and became an obstruction. That's just one of the many things that make The ABC Murders feel unpolished and a bit rough around the edges. At just 6-7 hours for a single playthrough and with little replayability outside of the achievements, I'm not entirely sure that it does justify that high a price, especially when there are other similar titles that offer more for a lower price point. Agatha Christie: The ABC Murders is a very enjoyable point and click adventure game featuring a varied gameplay experience, a good plot, charming characters and great atmosphere. The game's short length and low challenge level, however, prevent it from being anywhere near a masterpiece. 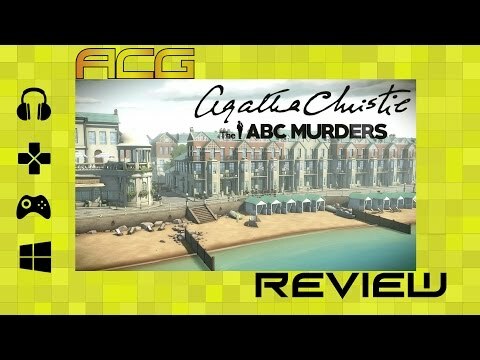 Agatha Christie: The ABC Murders is not a game that will blow your mind, but if you're looking to spend a few hours with an enjoyable adventure title then it's definitely the game for you. If you're like this writer and enjoy even a decent police procedural game – especially in a medium where they're dishearteningly absent – Agatha Christie: The ABC Murders is a deserving title in your mystery fiction library. The video game adaptation may lack presentation value, but a strong plot, fun deductions, and a rewarding conclusion make up for it in the end. Agatha Christie – The ABC Murders will likely please fans of the prolific author's work with its accessibility and faithfulness to its source material. Just don't expect too much of a challenge in the gameplay department. A wonderful, but short, plot that will have you believing you own real life detective skills. Playing as Hercule Poirot is a mostly entertaining romp through 1930s London, minus a few hitches along the way. Agatha Christie - The ABC Murders is a satisfying point-and-click whodunit adventure with plenty of puzzles. I enjoyed myself, though. The ABC Murders makes for lighthearted detective fare, clean and colorful like a Saturday morning cartoon. And make no mistake—when I say it cribs from Frogware's Sherlock Holmes games, I don't say it with any malice. I'd love to see more classic mysteries turned into adventure games, and Frogware just happens to be the current studio to beat. While there are more complex and intriguing crime games out there and it isn't the longest game, The ABC Murders still offers good entertainment for the interested and serves as a decent port into the murder mystery puzzle genre. Some core mechanics need fine tuning, but the balance between the different game elements is generally good. The interrogation scenes as well as the deduction phases could be a bit more elaborate and slightly longer (because they are - hands down - the best bits of the game) but the overall flow of the game is pleasant. Agatha Christie: The ABC Murders is a gentle game, constantly giving players information via observation, conversation or reasoning, without ever pressuring them to solve the puzzles and to move forward with the story. My time with Hercule Poirot and his pal Hastings was memorable. Agatha Christie: The ABC Murders is a solid start to what will hopefully be a new franchise. It reminds me quite a bit of Frogwares Sherlock Holmes series, which took a few games to find its stride. The games focus on building up the character of Poirot and focusing on telling the story from his perspective pays off, in part due to Poirot being the most interesting character in the game.